This is evidence of unprofessional wiring. 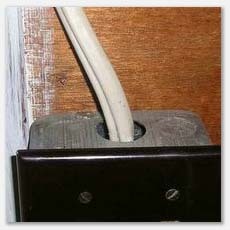 This electrical box should have a non-metallic sheathed electrical wiring* clamp on the top and this wiring should be behind sheetrock or in conduit. When we note items such as these, it triggers greater scrutiny of all electrical systems, since it is obvious that this was not installed by and electrician, without an electrical permit and not inspected by a municipal electrical inspector. Ohh, not actual scumbags, but in my opinion only!